Padlock Shims work on most locks with a shank. Set of 10 shims. Did you forget the combination of your combination lock? Did you lose the key to your locker lock? You may need these lock shims/shim picks with plastic coated handles to open that lock. Made of very thin spring steel, our padlock shims come in several sizes to fit the contour of the shackle of the lock. Just push one of the Lock Shims down between the shackle and the body of the lock and twist to disengage the locking mechanism (locking dog). 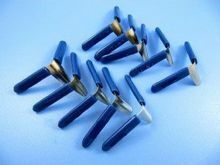 We also coated the shim handles with plastic to make gripping and pushing the shim easier. There are 10 shims in each set. These shims can be used over and over again and work on most padlocks and combination locks where access to the hasp notch is possible. If there is no gap between the hasp and body, then a shim won't work. Lockpicking is a skill. It may take practice to learn how to use these items effectively. As a result, due to the nature of these products, there will be no refunds for lock pick equipment. Sorry, gift cards, unregistered prepaid cards or International(non-USA) Cards are not accepted.. Orders with these will be cancelled.